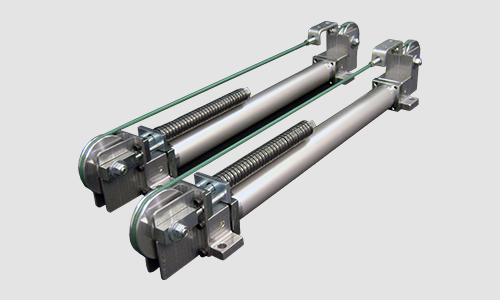 Models 15 - 50 "Air Actuator"
Exclusive Precision Block heads (models 15-32), extruded square aluminum heads with rectangular aluminum mount bar (models 40-50). One piece “C” Trolley standard on models 07-40.“H” trolley optional on models 15-40, “H” trolley standard on Model 50. Aluminum sheaves with steel needle bearings. Aluminum hard-coated tubes or optional steel tubes (special plating available). Nylon coated aircraft type steel cable (heavy duty cable is available). Air and oil use up to 150 psi. Optional SAE and Metric BSP ports available. Symmetrically attached sheave bracket can be rotate in 4 directions.